How many times have you felt miserable after binging on your favorite fried foods when on a “diet”? What if you favorite foods were available in healthier versions? That way you can enjoy them without having to worry about extra calories. 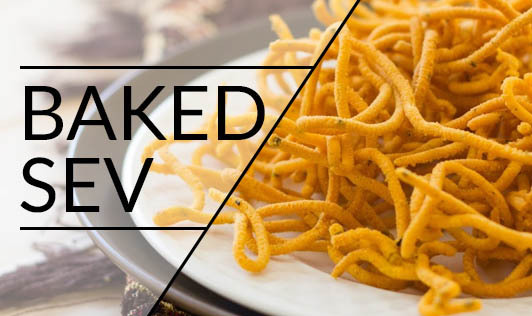 This baked version of sev is one such recipe. It tastes as good as the fried version and makes for a great topping on bhel, chaat, and poha. Place all the ingredients in a bowl, mix well, add 2 tbsp of water and knead to make semi soft dough. Grease the baking tray with a little oil and keep aside. Shape the dough into a cylinder and fill in a ’Sev press’. Now apply pressure to the Sev press layer the thin strands of sev onto the greased baking tray. Preheat the oven at 200°C (400°F) and bake the sev for about 10 minutes or until it turns light brown in color. Make sure the sev press plate you use has thin holes, so that the sev bakes quicker and is crisper. In case you are using a small baking tray, make 2 batches.